Chondroitin, sulphate, glucosamine, and other compounds are rich in a well cooked stock, and help reduce joint pain and inflammation. 4 pounds of beef marrow, knuckle bones. Grass-fed beef only. Instructions: Soak cold bones in water for 10-15 minutes. Water should cover the bones. This removes the impurities. Then cook your beef bones in water before making the stock. Bring a pot of water to boil with the bones. As soon as the water boils, turn off and drain completely. 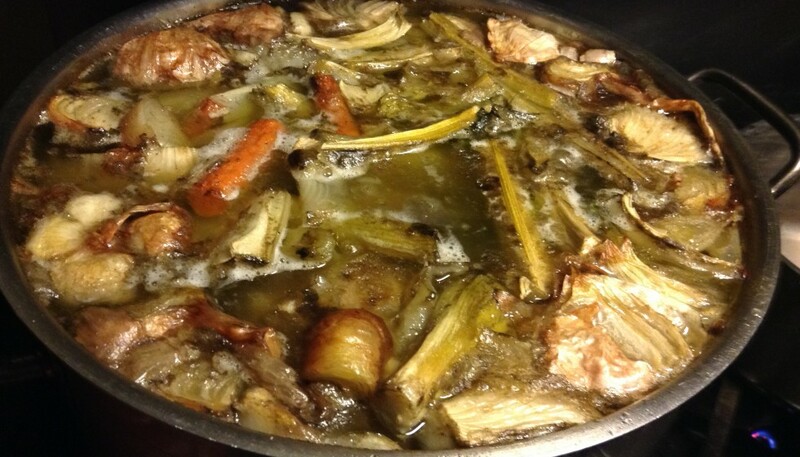 To make the stock: In a large pot, place the boiled bones and cold water vinegar, and vegetables. Do NOT skip the vinegar step; it draws the minerals out of the bones. Bring the pot to a simmer and reduce the heat to the lowest temperature. Let the pot sit for longer than you think is possible. It will be fine 4-6 hours or even overnight (on super slow simmer) with the lid off. Once it reduces, you can see what the flavor is really like and then add some sea salt to bring out the flavors. Added kombu and herbs (thyme, bay, garlic, star anise, cinnamon or ginger make for a richer stock, but be advised that if you add the bolder spices and/or ginger, this will flavor all of your stock.) Additional notes on beef broth: We have a 8 ½ quartcrock pot and use about 3 lbs of bones. If you find a farmer, it may require that you purchase 24 lbs of bones. If you wish to make a large stock with this quantity, it will require a very large pot! Try to use several types of bones, but always include the large knuckle that has a lot of cartilage. These can be bought from your butcher. Grass-fed beef only! Save any vegetables that will not keep until the day you make stock. Freeze your carrots, garlic, onion and celery trimmings in a bag until the day you will be making your stock. Bones should not be disintegrated. A pressure cooked stock should take about an hour or so. Using a pressure cooker should not make any difference in flavor, but the mineral content of a slow cooked stock will be better than one made from a pressure cooker. Pressure cooking will break down some of the proteins into individual amino acids, like glutamic acid. It is best to go with the slow cooked method over pressure cooker, but that being said, if you are short on time, go ahead and make your stock in a pressure cooker. Get into the habit of making a stock each week. Fish bones make for a great fish stock and a whole organic, PASTURED chicken carcass will also make for a terrific broth. As for the beef bones, always choose grass fed as it is preferred over grain fed because the grass fed animal is higher in omega 3 and vitamin A and D. Grain fed is higher in omega 6. The house will smell great each time you slow cook a stock — added bonus!